Kananaskis Country, also called K-Country by local Albertans, is a pristine place. Covering over 4,000 square kilometers of the eastern slopes of the Canadian Rockies, Kananaskis borders the town of Canmore and Banff National Park. Information about the provincial parks and recreation areas, important phone numbers, etc. There is no better place than Canmore to base your exploration and discovery of the Canadian Rockies. Bragg Creek is located 30 kilometers west of Calgary, near Kananaskis Country and is popular for shopping, with its quaint shops, restaurants, and mountain scenery. A leisurely drive through the park at dawn or dusk is a good time to spot a variety of wildlife. Find PDF Maps for Kananaskis Country and surrounding areas including Canmore, Banff and general overview maps of Alberta and the Canadian Rockies. Kananaskis weather and general climate overview, average temperatures, current weather conditions and links to weather forecasts. 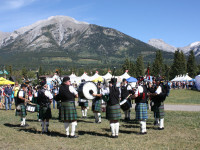 Discover some of the most popular annual festivals and events in Kananaskis and surrounding communities.